We always have guacamole for the Superbowl. We have it a lot of other times as well. We eat TONS of guacamole. The base of this recipe is from Rick Bayless, but I am sure that it has evolved over time. I love to use Tomatillo Salsa from Frontera Grill (Rick Bayless), but when I don’t have time to seek it out the Salsa Verde from Trader Joe’s is a good substitute. We LOVE it! 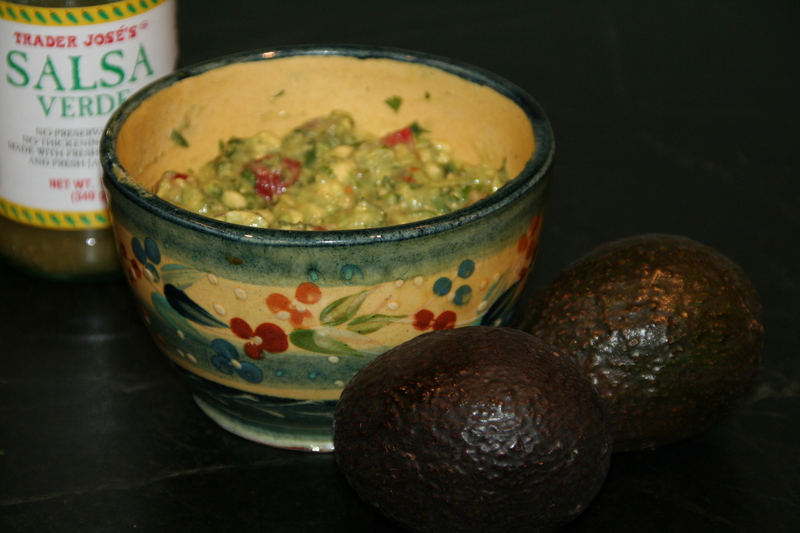 The salsa gives the guacamole a silky consistency and keeps the avocado from oxidizing. Fork mash avocado in a bowl. Add enough tomatillo salsa to make the consistency creamy. Stir in additional ingredients. Serve immediately with tortilla chips.